Oh my god. I was sewing! It felt like like it had been AGES and not the two weeks that it's been in reality. 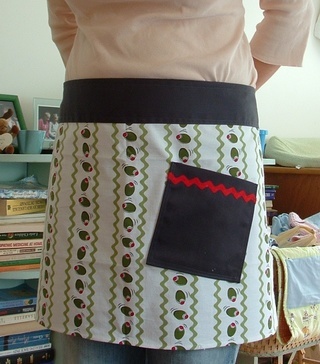 Anyway....I tackled the September theme of a dishtowel apron for Tie One On. I am so, so grateful that Amy chose this theme for this month--it was a tiny enough project for me to handle, and give me the boost to get back into crafting after birthing. Thanks, Amy! I used an olive dishtowel from Target, added a waistband, ties and a pocket (I loved how this dishtowel was begging for more Ric Rac by the lines between the olives!). So easy, and so fun. This one will be headed to a certain martini lover I know for Christmas.